Motivation, ambiguity and player priorities. It’s something we talk a lot about at whilst making The Last Night. The game is narrative-driven, but we’re creating a richly detailed city full of unusual characters. And something is becoming increasingly apparent to us: the best stories are going to come from letting the player make their own sense from ambiguity. The main quest will essentially chivvy you between key locations and create some dynamic changes to the game world. However, it’s going to the side-quests, exploration, details and story-sensing that really create memorable moments. To test this approach, and see how it correlated to Kelly’s ideas, I created a very short, ongoing survey (please fill it in!) about what people value in storytelling. I started off by asking a select group of my peers (friends who are writers/creators and a few colleagues etc) and then opened it up on Twitter. Aside from some very minor variances, the hierarchy of preference has basically remained unchanged since the first few respondents. I know I’ve taken a totally haphazard, rigorously unscientific sample group, but let’s take a look at some of the results and how they apply to Kelly’s theory. People and players don’t want to be told what to believe or how to play. At first glance, this question might not seem to relate to the act of telling or presenting a story. However, these criteria have a huge impact on how one would approach their storysense. 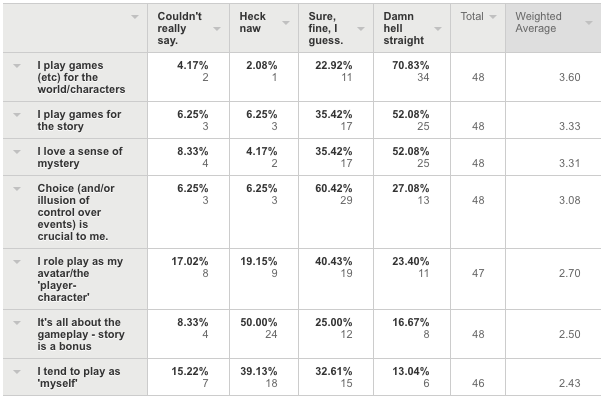 That the results are so close demonstrates how nuanced telling a great story is. Yet the fact that ‘strong motivation’ wins out suggests a few insights. Motivation can and should be found in and reinforced by many parts of a game world. Therefore the player can constantly re-evaluate ‘their’ and the player character’s motivation. It’s possible to ‘tell’ the player what their motivation is (scripted sequence, exposition, set pieces etc), but seeing as ‘action/gameplay’ comes a clear last, that choice seems lazy compared to letting the storysense breathe through great supporting characters and new ideas. Really, motivation/a strong protagonist/originality are obviously all very closely related. Though ‘emotional realism’ is also low in the rankings, suggesting players are happy to suspend disbelief regarding motivation (i.e. think beyond our own banal experiences) long as it feels original and makes us feel strongly ‘for’ or ‘against’ our protagonist. 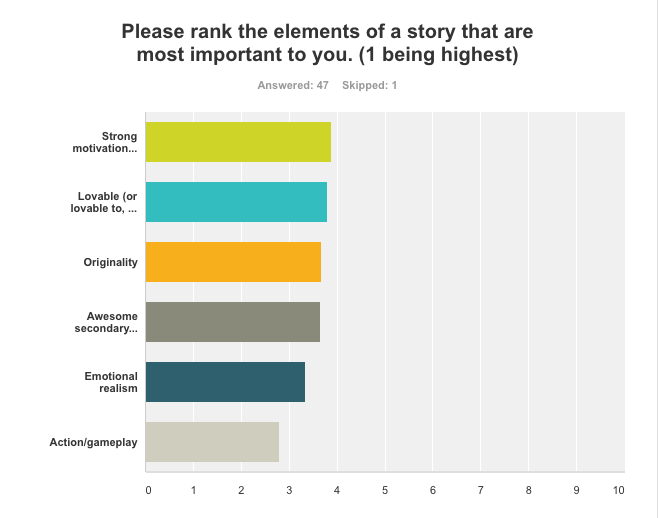 Storysense posits that a narrative should be built up from a combination of engagements throughout the game and its systems. That ‘I play games/etc for the world/characters’ strongly supports this idea. ‘The story’ is a close second, meaning that the world and its inhabitants must support an over-arching narrative to feel meaningful. I took the ‘sense of mystery’ to potentially mean that there’s nothing wrong — the opposite in fact — to some ambiguity. Hammering your authorial vision of the story or the player-character’s personality seems like a bad idea to me. Take Bioshock —a franchise that generally has great storysense (audio logs, environments, little side-stories) but usually invalidates whatever interpretation of events you’ve built up by smashing a corny twist or binary moral view over your head by the denouement. Contrast that to something like Bloodborne (and the Souls forebears) which has quite rightly been frequently lauded for the way it lets players piece together a version of events from fractured clues. You beat the game(s) and there’s a certain ending, but unless you’ve done some digging (and even then it’s wooly) you won’t really know what that ending signifies. Anecdotally, have a quick think about how much fans have enjoyed speculating about the underlying narrative of those respective franchises. This one is fairly straightforward. The notion of ‘storysense’ stretches the assumption many of us might hold that dialogue should be the primary source of NPC character development and of narrative exposition. However, we do need some dialogue — so how to work with that, and play to what the player wants, balanced against the narrative needs, and then how we want to innovate from there? Well, it stands to reason that if you build an interesting world, being able to delve subtly into its history and lore would add to the storysense. Say a character mentions they remember the city before x took over — and later you meet a group of agitators. You’ve already got context and some foreshadowing. What if, based on some questions and interesting answers you asked an NPC, you could then go and explore an area that somehow visually depicted that transition? Much better combination of dialogue and exploration, followed by extrapolation. It also follows that players want a chance to role-play through dialogue, and that ‘a large contrast in choices’ would facilitate that role-play, allowing for distinct voices — something I go into slightly more detail on in my piece on great game writing, even if you’re not a game writer. However, let’s also remember from the previous question that ‘I role-play as the PC/avatar’ received the relatively low weighted average score of 2.70. Kelly discusses the avatar as a ‘doll’, and being removed from the player identity, and this seems to hold — yet players still want to be able to guide how that avatar/doll itself is developed. 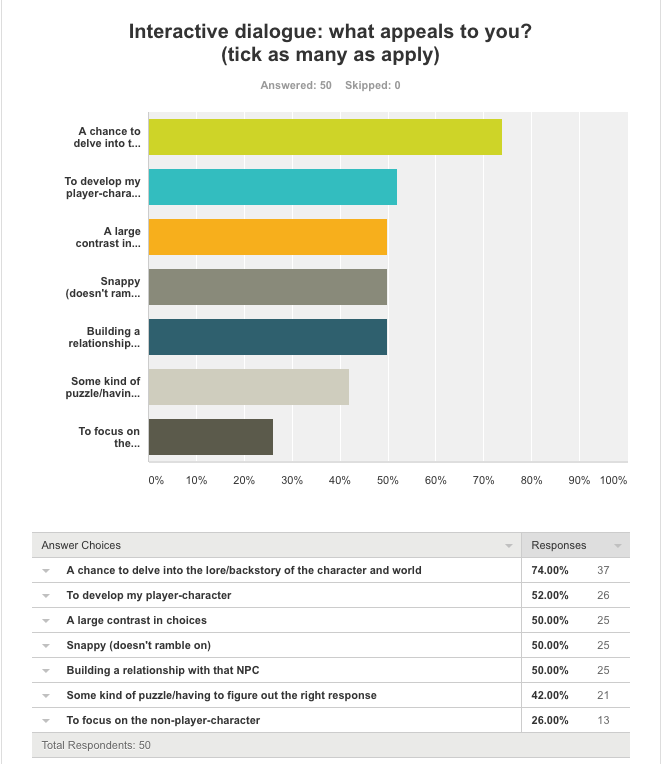 I was intrigued to see ‘a focus on the NPC’ so low, but I suppose it goes to show that — remember how ‘awesome secondary characters’ ranked well before — one should delineate carefully between NPCs there to serve the storysense and narrative, and recurring, important secondary characters. Don’t get bogged down spending too many words (‘keep it snappy’) unless you really think that character is important to the story, the world, the doll, and the player. Motivation can be ambiguous, or even ambivalent — leave it to the player to decide, but give them plenty of ammo. Keep dialogue super snappy, contrasting, and draw a firm line between general NPC and your cast of secondary characters. Writer/narrative designer: Multiple Game Projects • Host a podcast on SFF writers & writing: uncaringuniverse.com • zen life.